The Uttar Pradesh government is pushing for a new airport at Jewar, in the same district as Noida and about 100 km from the Indira Gandhi International Airport (IGIA) in New Delhi. The state government feels Delhi will require a second airport in a few years and this is an opportunity. The GMR Group manages Delhi International Airport Ltd (DIAL). The state appears to have already sent a proposal for the Jewar airport to the Union aviation ministry, asking for a technical evaluation of the site. The Jewar proposal is not a new one. In 2001, Rajnath Singh, now the Union home minister and then the UP chief minister, first proposed an airport there. So did Mayawati after she became CM in 2007. Her proposal did not make progress because of a clause in the agreement with GMR for DIAL, preventing the establishment of a new airport within 150 km of IGIA. However, Union minister of state for civil aviation, Jayant Sinha said, “within a few years, we will be using all of the capacity (at Delhi). It is necessary for us to build a new airport”. Sinha said on Thursday that planning for increasing of capacity at the Delhi airport terminals would depend on improvement in airside capacity. DIAL wishes to take steps to increase the airside movement from 67 to 95 an hour. UK-based NATS has been asked to help. “What we agree on is that airside movement will have a bearing on the building of a new terminal. With Delhi having three runways, it gives us significant capacity to increase the airside movement,” Sinha said. According to the minister, the improvement in airside capacity would lead to the addition of around 70 flights. And, IGIA's passenger handling capacity would increase to around 90 million annually, from the current 62 mn, in the next two to three years. DIAL wishes airlines operating from its T1 terminal shift to T2, as it wishes to redo the former. “Airlines are demanding new slots if they shift to (the) T2 (terminal). The airport authority is unable to give them that, as Delhi is already congested. The airlines have also asked for significant reduction in airport charges, which the airport has not agreed to,” said a senior ministry official. There have been differences between DIAL and IndiGo, SpiceJet and GoAir on a shift to T2. The airlines have baulked, citing operational constraints. According to the DIAL plan, there is to be a Rs 16,000-crore (Rs 160 billion) investment to expand the airport’s capacity from 62 million to 109 mn passengers per year. 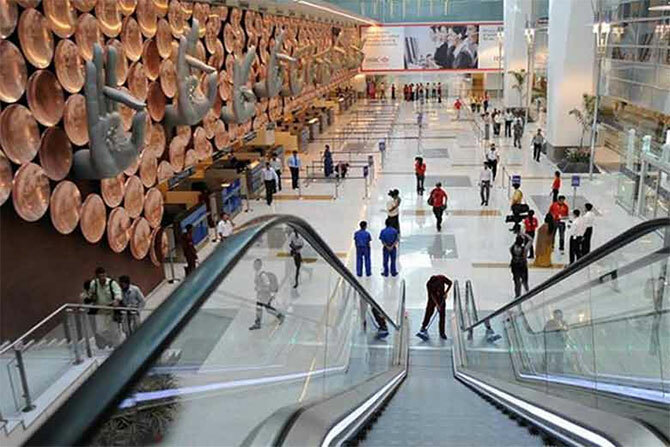 DIAL has already invested around Rs 100 crore to renovate T2. In 2016, Delhi airport handled nearly 56 mn passengers, joining the ranks of some of its busiest global peers such as those at Bangkok, Singapore and New York. IndiGo and Air India added the highest number of flights in the world last year. The highest capacity addition was on the Kolkata and Dubai routes - 350,000 and 989,000 seats, respectively.